Daily fantasy sports soccer is a relatively new phenomenon and many players will be taking tentative first steps into this exciting new format. Here are ten tips any new players to the game which will set you on your way to success. 1. Start Low – Don’t jump straight in to high buy-in contests. You’ll find a great amount of small contests where you’ll gain a great feel for the both the contests and the overall experience. In these events you’ll be able to refine your strategy before heading into games with higher stakes. 2. Specialize on a particular league – Currently, there are two separate leagues running at DraftKings – the English Premier League and the UEFA Champions League. The English Premier features twenty teams who will all play each other twice a season, meaning they play most weekends and the occasional midweek. The UEFA Champions has a league format in the early part of the competition between September and December and a knockout format from January to May culminating in the final. Specializing in one or the other league might be the best way to start. 3. Follow Injuries Closely – Not keeping on top of the latest injury situations can be disastrous in daily fantasy sport and in this day and age there is no excuse for it. Use social media and the relevant leagues/teams websites to keep informed, and you’ll have a big edge over the entrants that don’t! 4. Goals win contests – A quick look at the point scoring system at DraftKings tells you how important goals are. If a player scores a hat-trick in a given week and you haven’t got him in your line-up, you can forget winning that week. When picking your roster, start with the strikers, and then look for those goal-scoring midfielders/defenders. 5. Forget about those great defenders – In DFS soccer there are no points for making a great tackle, or dominating at the back. This great player might gain the team a clean sheet, but he will also gain his fellow defenders the same points for gaining a clean sheet. If one of his fellow defenders has a cheaper salary or is more likely to score – why pick the one doing all the defensive work? 6. 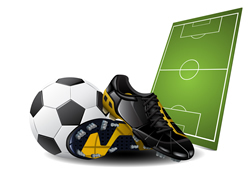 Use combinations – A goal is worth ten points and an assist is worth six points in DFS soccer. What if the one goal could gain you sixteen points? After picking that striker, look to see if there is a player (will be a midfielder in most cases) who is making the majority of assists for the team. Picking both players is something of a boom or bust strategy, but it can pay big, especially in those large entry contests. 7. Consider Line-ups – You’ve spent a large part of your salary on one particular star player and then you find they are not playing as they are being rested – this is annoying, but in some cases can avoided. Some teams will rotate their line-ups, especially if they have a big game coming up in the next few days (for example, at the weekend before a big European game the following Tuesday or Wednesday) and are playing a game against a weaker team. Consider how a manager might be thinking and you’ll gain an edge over the other entrants. 8. Use the Oddsmakers – As a beginner, it can be difficult getting a handle on which teams will dominate that weekend, how likely a player is to score or which games will be low scoring affairs. Let the sportsbooks do this work for you, and use them to help evaluate the value picks. 9. Pick Penalty Takers – A goal scored from a penalty kick is worth the same ten points as it is from open play, so know who these players are. Usually they will be the strikers of a team, but occasionally a team will have a midfielder or a defender taking them. On the same note, consider who the back-up penalty taker might be if a player is injured/rested. 10. Pick a Goalkeeper who will win – If the goalkeeper is on the winning side you’ll gain five points and an extra five points if he keeps a clean sheet. Pick a goalkeeper of a team you think will win the game, maybe 2-0 or 3-0, as opposed to a keeper who might be involved in a 0-0 draw. When first playing, it can be an idea to enter the low buy-in contests that feature a great number of players. This can obviously gain you a big prize for a small stake, but it will also enable you to gain a feel for how good you are in comparison to other players. You can play fantasy soccer for cash at DraftKings legally.